Click here for the 2016 HockomockSports.com Baseball Awards. Below are the official 2016 Hockomock Baseball All Stars. Franklin, 2 vs. Lincoln-Sudbury, 5 – Final – Franklin scored two runs in the bottom of the fourth to tie the game but LS responded with three runs in the top of the fifth to get the win. Ryan Hodgkins went 2-3 with a triple and a run scored, Josh Macchi was 1-3 with an RBI and a run scored, Mike Skaza went 2-3, Jason Ulrickson was 1-2 with an RBI and Alex Bissanti had a pair of hits for the Panthers. King Philip, 3 @ Stoughton, 8 – Final – Click here a recap of the game. 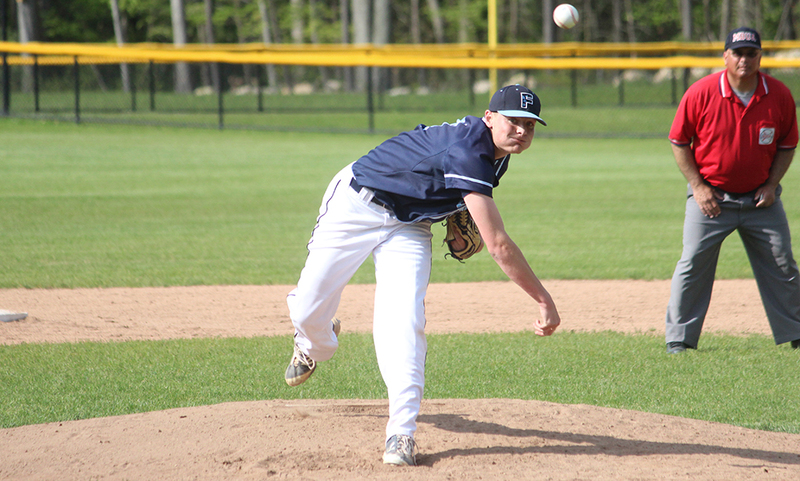 Franklin, 7 vs. Hopkinton, 3 – Final – Seven different Panthers recorded an RBI as the Panthers advanced to the finals of the Pedroli Tournament to play Lincoln-Sudbury. Nick Santucci went 2-4 with a double, a run scored and an RBI, Josh Macchi went 1-3 with a run scored and an RBI, Mike Skaza was 3-4 with a double, two runs scored and an RBI, Jason Ulrickson was 3-4 with an RBI, Joe Corsi had a hit, two runs and an RBI, Brad Jarosz went 1-1 with an RBI and Alex Bissanti had an RBI and a run scored. Ryan Hodgkins added three hits for Franklin, including a double, and scored a run. Sophomore Jake Noviello got the win on the mound, allowing a pair of runs in five innings of work, striking out seven. Ryan Morse had a scoreless inning in relief for the Panthers. Oliver Ames, 2 vs. New Bedford, 1 – Final – With the game knotted at 1-1 in the bottom of the sixth inning, Oliver Ames senior Ryan Adams cracked an RBI triple to drive in Matt Muir as the Tigers edged the Whalers. Muir led off the inning with a walk and was sacrificed over by Chris Romero, setting the stage for Adams’ hit. Sam Burr pitched four shutout winnings for the Tigers to get the win. Taunton, 0 @ Durfee, 1 – Final – Taunton freshman Jack Moynihan was terrific on the mound for the Tigers but was the tough luck loser as the Taunton offense was unable to get anything going. Moynihan pitched six innings, allowing just the one run while striking out five. Moynihan only allowed four base runners, three hits and one walk. King Philip, 6 @ Dighton-Rehoboth, 4 – Final – King Philip’s Brooke Taute had a two-out, two-run home run in the top of the seventh, breaking a tie game and giving the Warriors the win on the road. KP originally captured a 4-3 lead on a two-out, two-run single from Caeli Bench in the top of the fifth inning. Chris Wagner, Hailey McCasland, and Ashley Hession each had two hits for KP. Freshman Elise Pereira had an RBI bunt single in the game and battled for a hard fought walk in the seventh inning. Kali Magane for the win for KP, scattering six hits while fanning 12 batters. North Attleboro, 5 @ Durfee, 2 – Final – Liz Morehouse knocked in a pair of runs with two hits and Amelia Murphy fanned seven batters as the Rocketeers picked up the win on the road. Mycala Moody and Meg Barlow each had three hits in the win and Gina Miceli added a pair of hits for Big Red. Oliver Ames, 0 @ Franklin, 5 – Final – The Panthers picked up their 15th win of the season, winning four of the five matches in straight sets. Rahul Herur fought back at first singles after dropping to first set to get a 2-6, 6-1, 6-2 win at first singles, Eli Brooks won 6-2, 6-2 at second singles and Dan Barrow won 6-2, 6-4 at third singles. Tom Mancini and James Johnston won 6-0, 6-1 at first doubles and Tyler DiPalma and Derek Wu won 6-0, 6-1 at second singles. North Attleboro, 5 vs. Durfee, 0 – Final – North Attleboro won all five matches in straight sets with two wins coming without a game lost. Mitchell Dyer won 6-1, 6-3 at first singles, Zack Pfeffer won 6-1, 6-1 at second singles and Barsomo Nuay won 6-0, 6-0 at third singles. The team of Jake Fontes and Daniel Zhang won 6-1, 6-1 at first doubles and Andrew Harris and Mayank Wadeker won 6-0, 6-0 at second doubles. Franklin, 2 @ Oliver Ames, 3 – Final – The Tigers punched their ticket to the postseason for the first time in over two decades behind a sweep in doubles play and one singles win. Sarah Leger won 7-5, 6-0 at third singles, Lark Warner and Valeria Tueme won 6-3, 6-0 at first singles and Claudia Ferrara and Rachel Stryke notched a 7-5, 6-1 at second doubles. Franklin’s Hannah Sweeney won 6-1, 6-0 at first singles and Anna Humphreys won 6-3, 6-1 at second singles. North Attleboro, 5 @ Durfee, 0 – Final – The Rocketeers and Hilltoppers played 10 game prosets, with North Attleboro emerging victorious. Jordan Willis won 10-0 at first singles, Emily Chiasson won 10-0 at second singles and Azka Siddiq won 10-1 at third singles. Gabby Duva and Katie Demontigny won 10-6 at first doubles and Hana Hershey and Shurobhi Nandi won 10-3 at second doubles. FRANKLIN, Mass. – The top of the sixth inning of Monday’s contest between King Philip and Franklin could very well be what defines the Warriors’ season, and what ignites them into a lengthy tournament run. Losers of three straight coming into the marquee showdown against the Panthers, circumstances were not looking promising for KP as Franklin tacked on four runs in the bottom of the fifth to take a commanding 5-0 lead going into the sixth. However, that’s when everything began to go in the Warriors’ favor. In the top of the sixth, KP ‘answered the bell’ by plating a game winning seven runs en route to clinching at least a share of the Kelley Rex title with a pivotal 9-5 victory over the Panthers, who also had a chance at claiming a split of the title entering Monday. Franklin sophomore Jason Ulrickson was nearly unhittable through the first five innings. The left-handed starter’s only blemish coming on a single off the bat of Will Weir in the top of the first. From there on, Ulrickson retired the next 13 KP batters – getting the Warriors to go down in order in the second, third, fourth, and fifth innings. However, King Philip was finally able to solve Ulrickson’s mastery the third time through the order. The Warriors promptly put the first two batters on base in the decisive top of the sixth in the form of pinch hitter Ben Furfari, who was hit-by-pitch, and a Ryan Guenette single to right. Two batters later, Jon Rolfe loaded the bases on an infield single. Hitting in the third spot of KP’s lineup, Will Weir drove in Furfari for the first Warriors run on a sacrifice fly to center. Cleanup hitter Jack DiCenso chipped in with a two run double to right bringing in Guenette and Rolfe to trim the Panthers lead to two at 5-3. Kyle Guenthner then drilled a double into left driving in DiCenso for a one-run ballgame at 5-4. Ryan Coulter followed with a game-tying single to right and quickly scored the go-ahead sixth run on a single that dropped into left field off Patrick Limerick’s bat. The seventh and final run of the inning came on a Guenette single to left scoring Limerick. The Warriors were not quite done as they tacked on two more runs in the top of the seventh. Rolfe and Weir led off with back-to-back singles through the right side. The duo then converted a double steal during a Guenette at-bat with Rolfe successfully coming home for the eighth run. Weir came around on a Guenette single to score the ninth run and put KP on top 9-5. DiCenso started on the mound for the Warriors and tossed four innings of one run ball before Franklin tagged him for four runs in the bottom of the fifth. The first run came in second on a Corey Langevin single plating Mike Skaza. Langevin got things going in the fifth by reaching on a leadoff error in the KP infield. Number nine hitter Alex Bissanti put two runners on a hit-by-pitch, and leadoff hitter Nick Santucci bunted his way on to first base to load the bases with no outs. Ryan Hodgkins followed through with a two-run knock on a double to right scoring Langevin and Bissanti for the second and third runs. Skaza brought in Santucci and Hodgkins was able to get around the tag of KP catcher Nolan Bradley for Franklin’s fifth and last run. DiCenso was pulled after five innings of work allowing four runs on seven hits while striking out three. Weir elected to go with Jake Cavanagh for the final two innings. The senior first baseman and pitcher retired all six batters he faced – two of them coming on strikeouts – to pick up the win for the Warriors. “Jack (DiCenso) is a kid that’s done it all year long. I think this was the first time that he’s given up an earned run in this game here today,” Weir said. “I think he battled hard. Don’t forget that that’s a Franklin team that’s been hitting the cover off the baseball as of late. After combining to score just four runs in three games last week, Weir is nothing but thrilled with how his Warriors were able to come back with a nine run explosion on Monday. King Philip baseball (11-4 in league-play, 14-4 overall) hopes things continue to roll when they travel to North Quincy on Wednesday for a non-league game while Franklin (10-6 in league-play, 12-8) looks to get back in the win column on Wednesday when they take on Hopkinton at Natick High School. FOXBORO, Mass. – Over the last seven games, trying to limit Franklin’s offense has arguably been the toughest challenge in the Hockomock League. The Panthers have plated 51 runs in their current seven game win streak, an average of over seven per game, and got off to a hot start once again on Friday in a 6-2 win over Foxboro. Franklin scored two runs in the top of the first and third innings and added single runs in the fourth and the fifth. Foxboro’s lone strike came in the bottom of the third inning. Franklin senior Nick Santucci was hit by a pitch in the game’s first at-bar and moved to third on a hit and run single through the right side from junior Jake Lyons. Ryan Hodgkins connected for an RBI single through the left side. A fielder’s choice forced Lyons out at third but Mike Skaza popped out to center for a sacrifice fly to make it 2-0. Foxboro starter Colin Theoner limited the Panthers to just a single hit in the second inning but the Panthers’ offense cashed in again in the third. Hodgkins, Tyler Gomes and Josh Macchi drew consecutive walks to start the top of the third. Skaza grounded into a fielder’s choice but it was enough to bring Hodgkins across the plate and move Gomes over. Joe Corsi popped up for a sacrifice fly to bring in Gomes to make it 4-0. The Warriors responded in the bottom half of the inning but weren’t able to pull even. Franklin starter Jake Noviello got the lead off man with one of his four strikeouts but issued a one out walk to Foxboro’s AJ Bubencik. After inducing a fly ball to center for an out, Jesse Galanti singled into right field for the team’s first hit. Darren Kelly then roped a two-out, two-run triple off a full count to cut the deficit in half. A two-out single from Jake Lyons turned into a run in the fourth inning for the Panthers. Lyons stole second and Hodgkins connected for a ground ball into right field for a single. The ball eluded the right fielder though and Lyons rounded third and scampered in for a run to make it 5-2. It looked like Foxboro’s offense was going to cash in for the second straight inning in the bottom of the fourth. After reaching on a fielder’s choice, sophomore Chad Bearce moved to third when Cam Feldman reached on an error. Bubencik connected at the next at-bat for what looked like would be an RBI single but Franklin’s Hodgkins dove in for the catch to keep the lead. Two more walks to start the fifth inning helped Franklin add another run. Skaza and Corsi drew consecutive walks but a fielder’s choice forced Skaza out. A walk to Alex Bissanti loaded the bases for Franklin and Santucci cashed in with a sacrifice fly to make it 6-2. Noviello earned the win for the Panthers, tossing 4.2 innings with two earned runs allowed. Franklin lefty Ryan Morse came in to get the final out of the fifth inning and pitched two shutout innings to close the game. Thoener, who was making his first start of the season after dealing with injuries, pitched five innings while Andrew Block pitched a scoreless sixth and seventh for the Warriors. Franklin improves to 12-7 overall and 10-5 in league play. The Panthers will conclude league play on Monday when they host King Philip. Foxboro falls to 7-10 overall and 5-9 in the league. The Warriors will travel to Oliver Ames on Monday before hosting North Attleboro on Tuesday. Attleboro, 1 @ Mansfield, 2 – Final – Click here for a recap. Stoughton, 8 @ Canton, 5 – Final – Stoughton’s Nico Parmeggiani improved to 5-0 on the season, tossing 5.1 innings with just three earned runs allowed. Pat Hagerty paced Stoughton’s offense from the lead off spot, going 3-4 with an RBI and a stolen base and Ryan Sullivan also added three hits, a stolen base and a run scored for the Black Knights. Joe Piana broke up a 2-2 game in the fifth inning with a two run single, Justin Hutchinson had a pair of hits and Doug Seaman (2-4, two RBI) helped cement the win with a home run in the top of the seventh. Foxboro, 1 @ Sharon, 0 – Final – Aaron Wentling dazzled on the mound, striking out seven in a complete game two-hit shutout effort for the Warriors. Foxboro’s lone run came via junior Cam Feldman with an RBI fielder’s choice. North Attleboro, 5 @ Franklin, 6 – Final – North Attleboro plated four runs in the first inning but Franklin’s bullpen limited the Rocketeers to just three hits over the final 6.2 innings and the Panthers offense chipped away to get the win and qualify for the state tournament. Bryan Woelfel came in with one out and the bases loaded in the first and was able to limit the damage for Franklin. Woelfel went five innings, allowing two hits and one earned run while striking out three. Ryan Morse got the win, allowing just a hit in 1.2 innings. Franklin scored a run in the first, two more in the third and two more in the fifth to take a 5-4 lead. North tied the game in the top of the sixth but sophomore Steven Luttazi scored the winning run in the bottom of the sixth for the Panthers. Sophomore Jason Ulrickson went 2-3 and knocked in a pair of runs, Mike Skaza was 1-1 with a pair of walks, an RBI and a run scored and Tyler Gomes went 1-3 with an RBI and a double. Ryan Hodgkins (2-4) scored twice for Franklin and Cam Benham scored once. Andy Katch went 2-3 for North while Zach DeMattio had two RBI for Big Red. King Philip, 1 @ Taunton, 2 – Final (8 inn.) – Click here for a recap. Oliver Ames, 10 @ Milford, 4 – Final – Senior Kevin Geary notched his first career win on the mound as the Tigers rallied from a 3-1 deficit to take the lead. Sophomore Matt Muir cleared the bases with a three run triple, giving the Tigers the lead. Chris Romero, Josh Minuskin and Ryan Adams each had three hits on the day for OA while Muir, Matt Mancini and Chris Pearsons each had two. Mansfield, 6 @ Attleboro, 0 – Final – Mansfield senior Maddie Letendre tossed her first no-hitter of the season, striking out seven in the win. The Hornets took a 1-0 lead in the fifth and then tacked on five more runs in the sixth. Consecutive singles from Bri Homer, Jocelyn Reardon and Marissa Staffier resulted in the first run. In the sixth inning, Kara Bendanillo singled, Mady Bendanillo walked, Maddie Letendre had an RBI single, Rachel Carafa had a two RBI single, Reardon knocked in a pair with a double, Marissa Staffier knocked in another run and Megan Letendre singled. Canton, 3 @ Stoughton, 7 – Final – Karly Estremera and Sam Tullis set the pace for Stoughton’s offense, each scoring two runs each. Estremera hit a triple and stole two bases including a delayed steal of home while Sam Tullis added a solo home run to lead off the bottom of the fifth. Gina Carafa pitched seven innings, striking out five while giving up one earned run. Sharon, 1 @ Foxboro, 9 – Final – Foxboro celebrated its seniors with a hit parade, totaling 12 as a team. Emma Rohan struck out 10 while allowing just three base runners (two hits and a walk). Offensively, Kelli McCarthy went 2-4 with two RBI, Hannah Davis was 3-4 with a home run, a pair of doubles and three RBI, Kelly Fisher and Kayley Tran each went 2-4 while Chelsea Gibbons was 2-3 on the day for the Warriors. North Attleboro, 4 @ Franklin, 5 – Final – The Panthers used a suicide squeeze to score the winning run in bottom of the seventh for the win. Olivia DiGiacomo laid down a bunt with one out to score courtesy runner Kerry Blaney for the win. Maddie Connelly got things started in the final inning with a lead off double and moved to third on a single from Clara DeCarvalho (2-4, RBI double), who moved to second on the throw. A passed ball gave Franklin a shot to score the run but North was able to get the runner at home. After a walk to Alexx Niss (2-3, RBI double), DiGiacomo squeezed in the run. Before the winning run, Franklin rallied from a 4-2 deficit to tie the game in the sixth. Olivia Haba (2-3) led off with a single and pinch hitter Kim Moulton blasted a two-run home run to the game. Caroline D’Aprile got the win for Franklin, striking out five. Meg Barlow had three hits for the Rocketeers and Mycala Moody and Kaylea Sherman each had two. Taunton, 2 @ King Philip, 0 – Final – Strong defense helped anchor Taunton’s season sweep over the Warriors. Taunton head coach Dave Lewry said Jordan Wade played great at shortstop and Meghan Navarro did the same at second base. Lewry also pointed to Bailey Clapp’s outfield assist in the fifth, throwing out a runner with Sarah Bagge applying the tag at home. Aimee Kistner struck out four, allowing three hits in a complete game shutout. Liana Duarte went 2-4 with a run scored and a stolen base, Jaime Brown was 1-3 with a double and Bagge went 2-3. Milford, 15 @ Oliver Ames, 1 – Final (5 inn.) – Milford clinched at least a share of its fourth straight Davenport title, winning at least a share of the division ever since joining the Hockomock. Jess Tomaso was a perfect 4-4 at the plate, including a two run home run, and finished with five RBI. Kaitlyn DeCapua knocked in four runs on three hits, including a double, while Megan Jacques went 2-4 with an RBI. Kelley Reichert struck out four while scattering three hits for Milford. Jamie Gottwald went 2-2 with an RBI and a double for OA. Foxboro, 6 @ Mansfield, 10 – Final – Mansfield built a 9-1 lead in the fourth quarter and held off a late push by the Warriors. Ryan Smith had two goals and two assists to lead the Hornets while Connor Finerty also found the back of the net twice. Josh Schafer, Sam O’Connell, Hunter Ferreira (two assists), Joe Cox, Billy Grant and Jon Reed each scored once for Mansfield. Sean Powers made 13 saves in net for the Hornets. North Attleboro, 6 @ King Philip, 8 – Final – King Philip built a 4-1 lead by the end of the first quarter and never trailed in a battle against North Attleboro. Senior Sam Agricola led the way offensively with three goals and an assist and junior Tim Watson potted two goals and had one assist. Harry Fallon had two helpers for KP while Anthony Truini, John DeLuca and Zach D’Amico (six ground balls) each scored once. Steven Eaton led the Warriors with 10 ground balls and KP head coach Jacob Kravitz praised the work of sophomore midfielder Nate Minkwitz (five ground balls) for his excellent defense. Oliver Ames, 2 @ Franklin, 16 – Final – Franklin senior Abby Egan netted a hat trick, Julia Jette also scored a hat trick and had two assists and freshman Hailey Toolin scored her first career goal for the Panthers. Oliver Ames’ Erin Fitzgerald netted her 100th career goal for the Tigers in the game while Kendall Clifford also scored and Abby Duvall and Olivia Piazza each had an assist. OA’s Ariana Waldorf had 21 saves in net. Foxboro, 0 @ Sharon, 5 – Final – Sharon won all five matches in straight sets to pick up the sweep. Junior Griffin Fein won 6-0, 6-3 at first singles, senior Han Cui won 6-0, 6-0 at second singles and sophomore Andre Olivei won 7-5, 6-1 at third singles. Senior Adam Dobbin and junior Alex Romantz won 6-0, 6-0 at first doubles and senior Tilah Mehta and freshman Danujan Thirumavalavan won 6-1, 6-0 at second doubles. Franklin, 4 @ North Attleboro, 1 – Final – The Panthers clinched at least a share of the Kelley-Rex crown for the second straight year with the win. Junior Rahul Herur won in straight sets, 6-3, 6-2, at first singles and freshman Dan Barrow battled to a 6-4, 4-6, 6-4 win at third singles. Franklin swept doubles play with Tom Mancini and James Johnston winning 6-1, 6-4 at first doubles and Cam Piana and Jeremy Gan winning 6-3, 1-6, 6-3 at second doubles. North Attleboro’s Zack Pfeffer won 6-4, 5-7, 6-4 at second singles for Big Red. Mansfield, 5 @ Attleboro, 0 – Final – Mansfield kept its postseason hopes alive with a win on the road. Paulina Martin won 6-0, 6-2 at first singles, Kathleen Giffels won 6-1, 6-1 at second singles and Sarah Doyle picked up a 6-0, 6-0 win at third singles. Cathryn Heavey and Chloe Peters won 6-1, 6-0 at first doubles for Mansfield and freshmen Tessa Garufi and Elizabeth Elsner won 6-0, 6-1 at second doubles. Canton, 4 @ Stoughton, 1 – Final – The Bulldogs got a clean sweep in singles play and earned another win at doubles to beat Stoughton. Carly Scanlon won 6-2, 6-1 at first singles, Skyler Jabbour won 6-1, 6-0 at second singles and Jude Aboukhater won 6-0, 6-0 at third singles. Canton’s Tiffany Ha and Sarah MacQuarrie won 6-0, 6-0 at first doubles. Stoughton’s Kathleen Lapommeray and Amanda Galant won 6-7, 6-3, 1-0 (10-7) at second doubles. Sharon, 3 @ Foxboro, 2 – Final – Sharon clinched the Davenport division title for the second straight year, this time winning it outright. The Eagles swept doubles play while freshman Nupur Shulka rallied from a 1-5 deficit in the second set at second singles to secure the win for Sharon. North Attleboro, 5 @ Franklin, 0 – Final – North Attleboro and Franklin battled under the lights at the new courts at FHS. North Attleboro’s Julia Mark won 6-4, 6-4 at first singles, Jordan Willis won 6-0, 6-2 at second singles and Allie Grinavic swept 6-0, 6-0 at third singles. The team of Jhanavi Kapadia and Emily Chiasson won 7-5, 6-3 at first doubles and Gabby Duva and Katie Demontigny secured a 6-3, 6-2 win at second doubles for the Rocketeers. Milford, 2 @ Oliver Ames, 3 – Final – The Tigers swept singles play to secure a win over the visiting Scarlet Hawks. Riley Spillane won 6-0, 2-6, 6-0 at first singles, Valeria Tueme won 3-6, 6-3, 6-1 at second singles and Sarah Leger took a 6-4, 6-3 decision at third singles. Milford’s Julie Rabinowitcz and Megan Cafarella won 6-0, 6-7 (4-7), 7-5 win at first doubles and Kate Rosenblatt and Victoria Beyer won 6-4, 6-2 at second doubles. Franklin, 8 @ St. Peter Marian, 4 – Final – Franklin rallied from a 4-0 deficit in the sixth inning, plating eight runs in the top half to take the lead for good. Senior Nick Santucci went 2-4 with a double, a run scored and a pair of RBI, Ryan Hodgkins had an RBI and a double and Mike Skaza was 2-4 with a pair of RBI and a run scored. Bryan Woelfel, who had a pair of strikeouts, earned the win after an inning and two thirds in relief. Ryan Morse struck out one in 1.1 innings of work for the save. Foxboro, 2 @ Franklin, 14 – Final (6 inn.) – Junior Alexx Niss continued her hot streak for the Panthers, knocking in seven runs with a single, double and a three run home run. Olivia DiGiacomo went 2-3 with a double and two RBI and Maddie Connelly was also 2-3 with an RBI, scoring three runs. Allie Shea reached bases three times for Franklin and Rachel Cousineau went 2-2 with a pair of runs scored. Caroline D’Aprile struck out four, allowing just one hit in three innings of work for Franklin.